Beth Gurzler holds a BA in music education and performance and an MA in music education with a concentration in flute and early childhood music. She also performs with the Helderberg Madrigal singers, Albany Pro Musica, the Colonie Memorial Band and has appeared as soloist in area churches and schools. She has performed with several regional chamber groups and orchestras, and as principal flute and assistant conductor of the Clifton Park Community Orchestra. She leads workshops in early dance and music for the SCA specializing in early double reeds. Beth was the founder and administrative director of Pathways Community Music Center. Beth taught instrumental and classroom music in area catholic schools. She currently works as a visiting nurse and a substitute school nurse. Jack Ishman minored in music at Ithaca College where he took private lessons in voice with Carol McAmis, and tuba with David Undland. He is an extremely versatile musician, playing early winds (recorder, baroque flute, fife, krummhorn, sackbutt), early strings (lute, laúd, bandurria, mandola, viola da gamba), as well as some of their modern counterparts. Locally Jack has been involved with the Capital Pride Singers, the Averill Park orchestra, and the Capital Area Flute Club. Currently he is also in the Capital District Mandolin Trio where he plays mandolin, mandola and mandocello. In The Bleecker Consort, Jack has arranged a lot of pieces for the group, and has coached Medieval and Renaissance pronunciation in the many foreign languages in which the vocalists sing. Jack holds advanced degrees in Spanish language and culture, and specializes in the Renaissance and Baroque pastoral literature. Allen Lescak studied the piano at an early age, and continued with brass instruments from elementary school through college. In the late 1970’s, he discovered the recorder and the wonderful “noyse” of the early music repertoire. He plays a variety of instruments including the recorder, Renaissance flute and capped reeds. Over the past 30 years, he performed with a number of early music ensembles and most recently with The Bleecker Consort. He is a member of the American Recorder Society (ARS), and past President and Secretary of the local ARS chapter. He has attended numerous workshops and was one of the chapter’s regular conductors. Allen has advanced degrees in English and Library Science. Michael Murphy has studied recorder with Laura Hagen of Indiana University, Jacobs School of Music and attended workshops with John Tyson, Eric Haas, Tina Chancey, and Richie and Elaine Henzler. In addition to recorders, capped reeds, and percussion, he is a bass/baritone and former vocal student of Anne Turner. Michael has performed as an instrumentalist or vocalist with The Bleecker Consort, Lycaeides, Albany Pro Musica, Schenectady Light Opera, Capital Chamber Artists, Opera Excelsior, and Lake George Opera. Michael is a Distinguished Teaching Professor from the State University of New York and a Fulbright Senior Scholar in the fields of biotechnology and ethics in science. Janie Schwab is an accomplished dulcian, bassoon, and recorder player who holds a B.A. from Wellesley College in Astronomy and Music. She studied with Thomas Forest Kelly, Eva Linfield and Dan Stillman. In addition to The Bleecker Consort, she has played with Tufts Early Music and Ars et Amici. Professionally, Janie has done research and education in the fields of Astronomy and Atmospheric Science at Harvard University and the Dudley Observatory. Deborah Segel is a founding member of The Bleecker Consort, and has been active as an enthusiastic amateur recorder player and musician for over 20 years. In the past, she was involved in program development, music arrangement and performance of medieval music in several local schools. She has performed with The Bleecker Consort in a variety of area venues, including the Dance Flurry and in St. Paul’s “Music at Noon” series. She has also studied Renaissance musical instruments and performance practice at several workshops, and has many years of experience as a choral singer. In addition to playing a variety of recorders, she also sings, plays the vielle, a variety of hand drums, percussion and other instruments. Her main day job is operating Segel Violins in Troy, where she repairs and sells violins, violas,cellos and their bows. Ann Githler, now retired, was a founding member of The Bleecker Consort. She pursued piano studies and eighteenth century harmony until she moved to Albany in 1980 where she was exposed to early music. 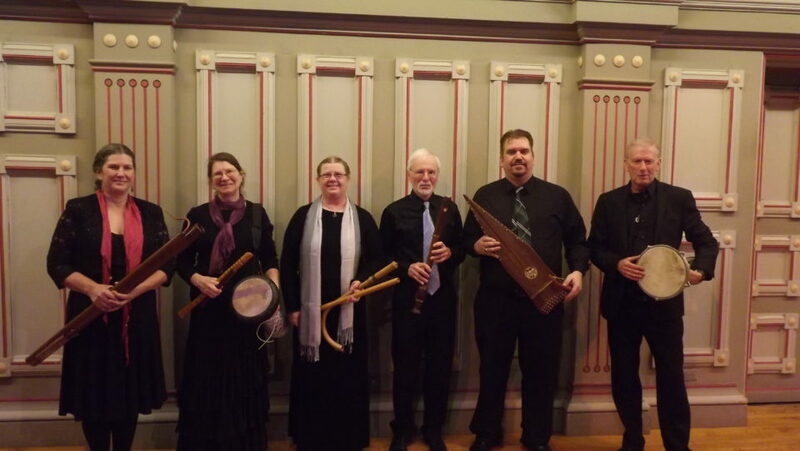 After studying various instruments with professional musicians specializing in medieval and renaissance repertoire, she traveled with Ars & Amici, an early music group from Boston led by Sheila Beardslee, to venues in Europe. Instruments include early winds (recorders, shawm and krummhorns) strings (viola da gamba, hurdy gurdy, harpsichord and harp). She retired as a Physician Assistant from the VA Hospital to take up additional instruments – accordion and banjo! – at Old Songs.